How to Build a Strategy + an Example. 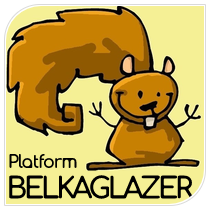 Belkaglazer Researcher is a freeware soft that allows you to do some studies of the FX market. 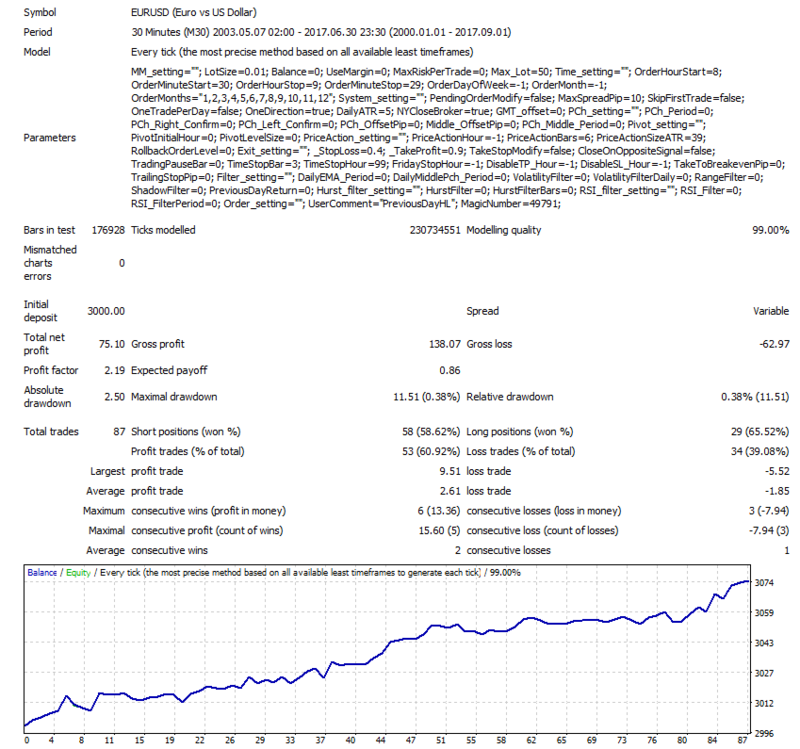 This tool may give you ideas for creating your own trading strategy. The data loading might take a few minutes. The ‘Researcher’ automatically calculates the most popular timeframes (M1, M5, M10, M15, M30, H1, H2, H4, D1) from 1-minute data. The ‘Research (F5)‘ button will become active once the data file is loaded. This research shows that the real distribution of price returns (changes) does not follow a normal distribution. Standard deviation (σ) is a measure of how spread out price returns are from an average value. Mean (μ) is the simple average of the price returns. A momentum strategy is based on the tails; a mean-reversion strategy uses the peaks. 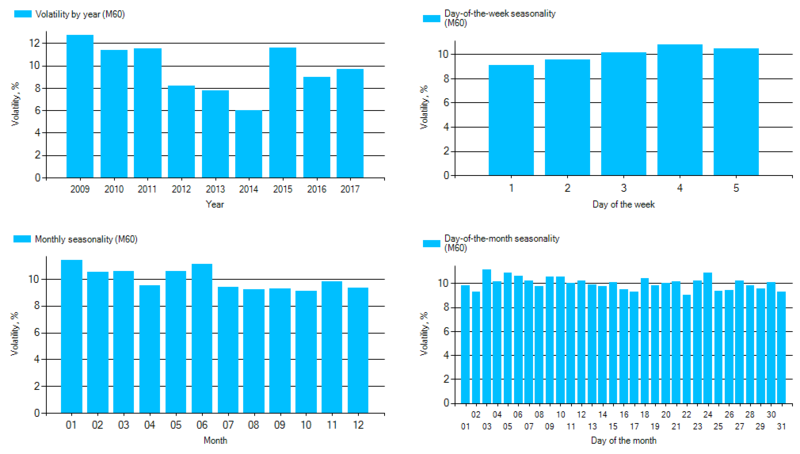 This research illustrates the intraday seasonal patterns in volatility during an hour or day. 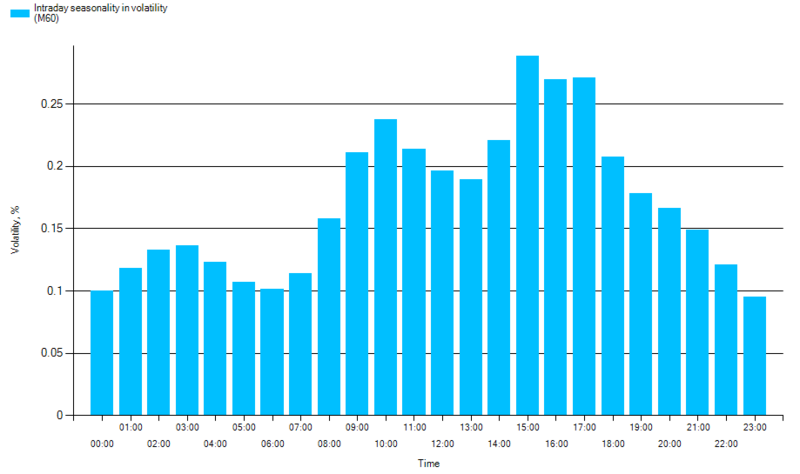 Average hourly volatility can be used to predict potential amplitudes of hourly price movements. 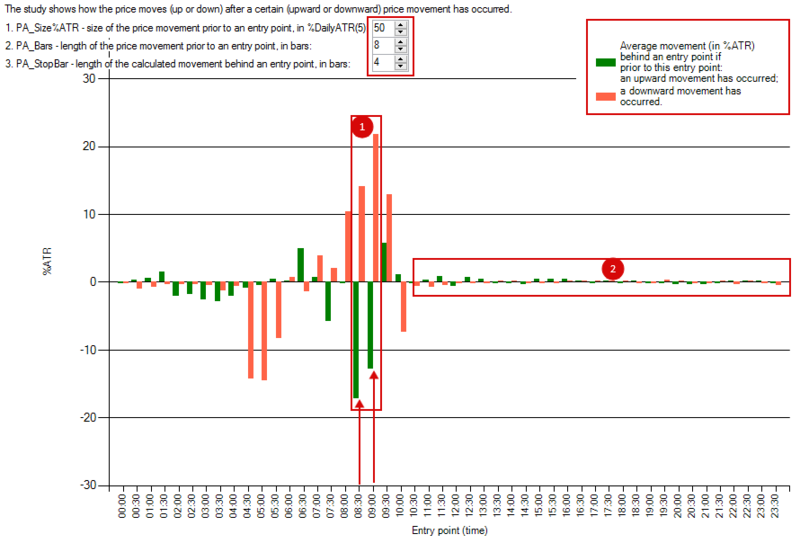 The diagram displays regularities/trends in intraday volatility. The regularities are based on steady factors, such as opening/closing hours of the biggest financial centers or the hours at which various countries release important economic news. 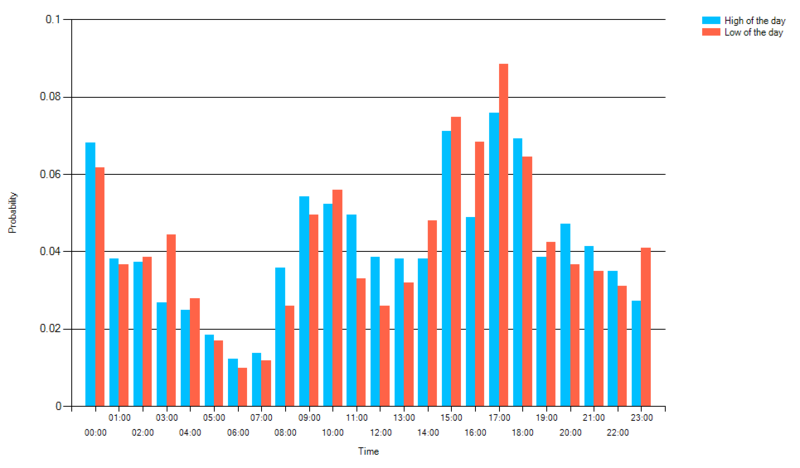 Different currency pairs are actively traded at different times of the day. 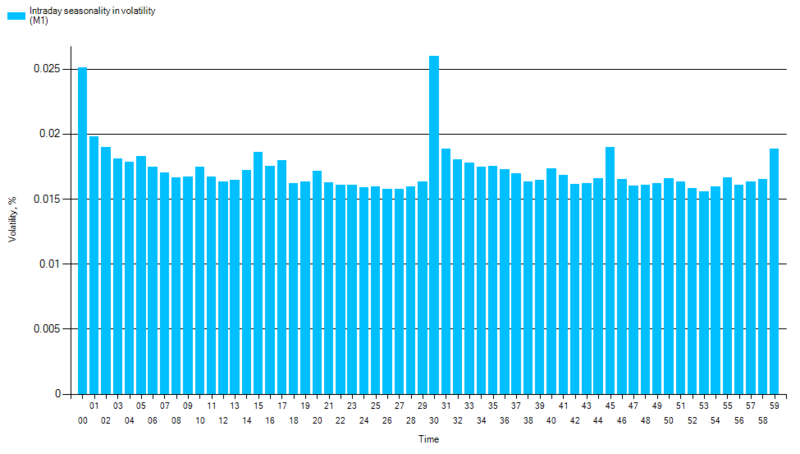 Take notice of the volatility outbursts during the 0-15-30-45-59 minutes. These outbursts are caused by the fact that most robots/traders use standard M15, M30, H1 timeframes. The initial goal of this study is to find out when the high or low of the day will most probably occur. 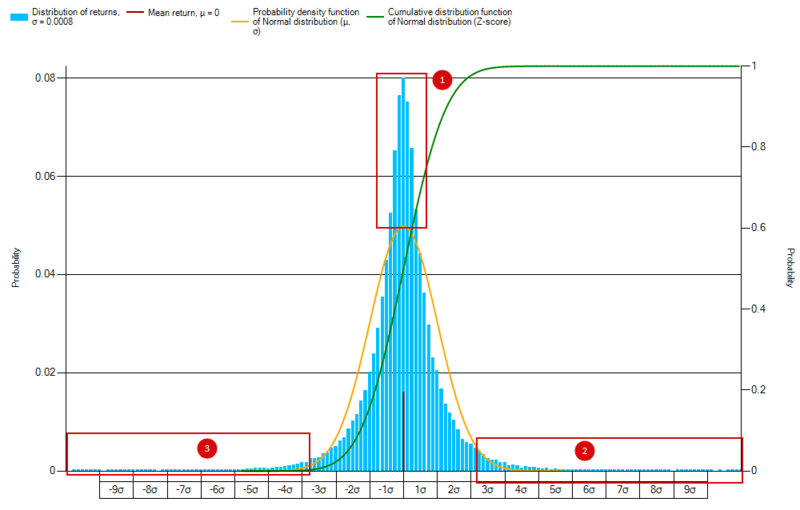 This diagram can help estimate the probability that a trade will be successful in the chosen direction. For example, if the price has fallen to the “lower” level of a local range at the time when the minimum of the day is most likely occurs then it may be a great time to buy. The seasonality is an important factor in Forex trading. For example, the volatility can narrow during Monday and expand during other days of the week. There is a fundamental difference in how some currency pairs behave during summer, winter, etc. The study shows how the price moves (up or down) after a certain (upward or downward) price movement has occurred. Let’s look at an example with EURUSD pair. The green bar (1) at 8:30/9:00 am (New York Close 5-day Charts) shows that if for the previous 8 bars the upward price movement has exceeded 50% of the daily ATR then the price moves down (on average) by 17/13% over the next 4 bars. The red bar (1) at 8:30/9:00 am (New York Close 5-day Charts) shows that if for the previous 8 bars the downward price movement has exceeded 50% of the daily ATR then the price moves up (on average) by 14/22% over the next 4 bars. Take notice of the time after 10:30 (2). The lack of trends means that the price movement after 10:30 does not depend on the previous short-term price movements. Trading foreign exchange on margin carries a high level of risk, and may not be suitable for all investors. The high degree of leverage can work against you as well as for you. Before deciding to trade foreign exchange you should carefully consider your investment objectives, level of experience, and risk appetite. The possibility exists that you could sustain a loss in excess of your deposit and therefore you should not invest money that you cannot afford to lose. You should be aware of all the risks associated with foreign exchange trading, and seek advice from an independent financial advisor if you have any doubts.